Each year the FFCT (Fédération Française de cyclotourisme) organises their wonderful “Semaine Federale”, a superb week of cycling and socialising attended by over 10,000 cyclists from across France and Europe. 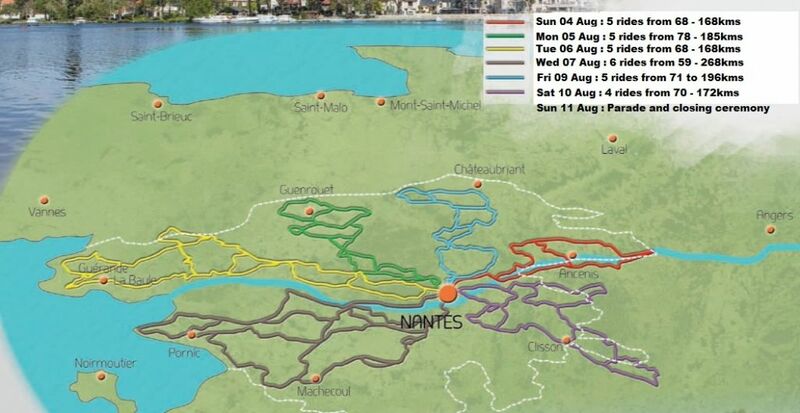 It is a non-competitive week of cycle touring around a different region of France each year. Each region selected to host the event pulls out all the stops to showcase the history, produce and beauty of their area with four or five fully sign-posted rides to choose from each day ranging in length from 70 to 200km depending on your appetite (and you will surely have one). week. You can either self cater at the camping site or you can ride to the Semaine Federale Village for your evening meal, which is €14/head. This is a proper multi-course full-on meal including wine, water and bread. If you do not wish to camp then dormitory-style accommodation is around €135 per person per week. Ok, this is more expensive than camping but it is still a bargain. The 2013 Semaine Federale will be held from 3rd to 11th August in Nantes in the Pays-de-la-Loire region of Western France. Nantes is around 177km from St Malo, which has a direct ferry service to Portsmouth. Other ports are also available, including Le Harve (384km), Caen (300 km), Cherbourg (339km) or Calais (600km). Full details of the week can be found at http://www.sf2013-nantes.org, though the site is mainly in French there is an English page providing some high level information. Sat 03 Aug : Pick up registration documents and set up “Camp Willesden” at the Semaine Federale camping site. I am interested in doing this ride with some friends. Do i need to join your club (or any club) in order to do this ride? Im looking for convenice and and organization that can direct me so that I can get some dirsection. I am also interested in kowing how much the cost is. I see you have some listed trates above. Are there any other rates? I believe as a UK resident you do not need to belong to a cycling club to do the Semaine Federale . If you do not want to camp then the Dormitories are €140 per person per week. PLease note that the Semaine Federale online entry system has been delayed, by I heard today that they hope to have it running by 11th Feb.
Is it too late to register for this year’s event? I believe online entries are still open. Go to the FFCT site and follow the links to the Semaine Federale online registration. The registration process is in French, but reasonably straight forward.